Linear A and Linear B are the names given to two sets of scripts from ancient Greece. A third known writing form of the time is Cretan Hieroglyphic. The Linear A script was used by the Minoan civilisation, which flourished on the island of Crete, whilst the Linear B script was used by the Mycenaean civilisation, which was centred on the Greek mainland. All three of these scripts were found in the same location at Knossos. Whilst Linear A has yet to be deciphered, Linear B has been found to be the oldest preserved form of written Greek that we know of at present. During the early years of the 20 th century, the Minoan civilisation was discovered by the British archaeologist, Arthur Evans. One of the most important sites of this civilisation was Knossos, where a palace was unearthed. Within the ruins of this Minoan palace was an archive of clay tablets, and it was on these tablets that Evans observed a number of different scripts that were unlike any that had been known up until then. Prior to Evans’ campaign, Knossos had been excavated in 1878 by a Greek businessman and antiquarian by the name of Minos Kalokairinos, who was probably the first person in modern history to have discovered a tablet with the Linear B script. One of these was a pictographic writing system known today as Cretan Hieroglyphic, and is believed to have been developed around the end of the 3 rd millennium BC. The other two were named Linear A and Linear B respectively, as a linear structure was used to construct its characters, unlike the pictographic Cretan Hieroglyphic. Of these two scripts, Evans determined that Linear A had preceded Linear B. The former developed around 1700 BC, whilst the latter about 250 years later. Additionally, Linear A and Cretan Hieroglyphics may have been used in parallel, as Evans speculated that Linear A was used for writing religious and administrative documents, whilst Cretan Hieroglyphics was employed for mundane affairs. Apart from Knossos, examples of documents written in Linear A have been unearthed in Cretan sites such as Haghia Triada and Phaistos. Outside Crete, evidence of this script has been found in areas such as Rhodes and Miletus. By comparison, evidence of the utilisation of Linear B has so far been limited to major palace sites, including Mycenae, Pylos, Thebes and Tiryns. Of the two scripts, only Linear B has been deciphered so far. The man credited with the decipherment of Linear B is an architect by the name of Michael Ventris, who made a breakthrough in 1953, 12 years after the death of Arthur Evans. 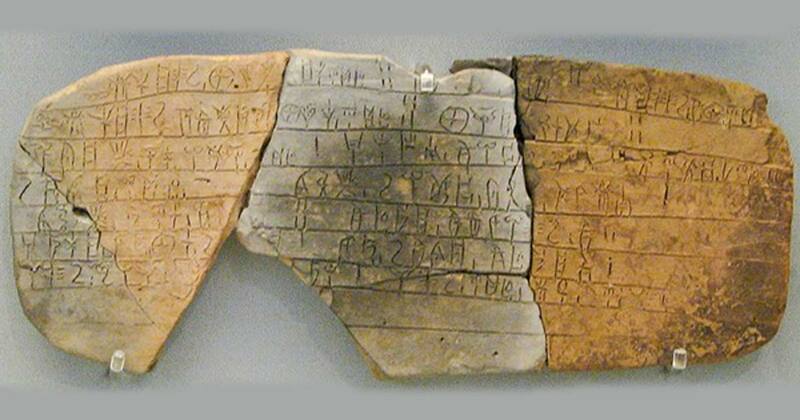 At that time, scholars were of the opinion that Linear B was a form of Minoan language that was distinct from Greek. Ventris, however, proposed that Linear B is an early form of Greek. Thanks to this interpretation, Ventris manages to decipher Linear B. Whilst most of the documents written in this script can be read today, there are certain features of Linear B that are still a mystery. Moreover, certain syllabic signs have yet to be interpreted conclusively. As for Linear A, this script has not been deciphered yet. Whilst these two systems are said to resemble each other, the underlying language of each script is quite different. It has been pointed out that when Linear A was deciphered using symbols from Linear B, the result was a jumble of words which did not have any meaning. Furthermore, the underlying language of Linear A seems to be unrelated to any other presently known language. Nevertheless, scholars have attempted to make some sense of the documents written in this script. For instance, the majority of documents written in Linear B have been found to contain administrative information. Therefore, it has been speculated that the Linear A documents have a similar function, and also contain such information. In addition, Linear A inscriptions have also been found on ritual and religious objects, for instance, votive figurines found in sanctuaries. Therefore, it has suggested that Linear A was also used for religious or ritual purposes. The content of the scripts falls far short of providing the drama that the Greek literary giants like Homer or Sophocles could, as they seem to have served a more practical and mundane purpose. However, being from a somewhat more ancient time, the three scripts use their own words to tell a more modest tale and until the Linear A code is cracked, it would seem the full story has not been told.